The Mosaic Boxer Crab is rarely seen outside of its little hidey hole. Lybia tesselata is a true crab as it needs to shed it exoskeleton in order to grow. They are sought after by the aquarium trade for their ornate carapace and unique nature. They can be extremely vulnerable to predation because of their size and lack of large pincers. Infact this crab has devised a way to not only feed itself but defend itself while supporting a whole other community of life. Notice the two pom-poms (boxing gloves) it is holding, these are a type of anemone (one of three kinds) used to protect itself and collect food at the same time. By using a boxers style approach of steady jabs, this true crab stings and collects micro organism munchies from the water column, then wiping the food into its mouth to feed. This remarkable symbiotic relationship also allows the anemone to gain nourishment and continues to grow as well. 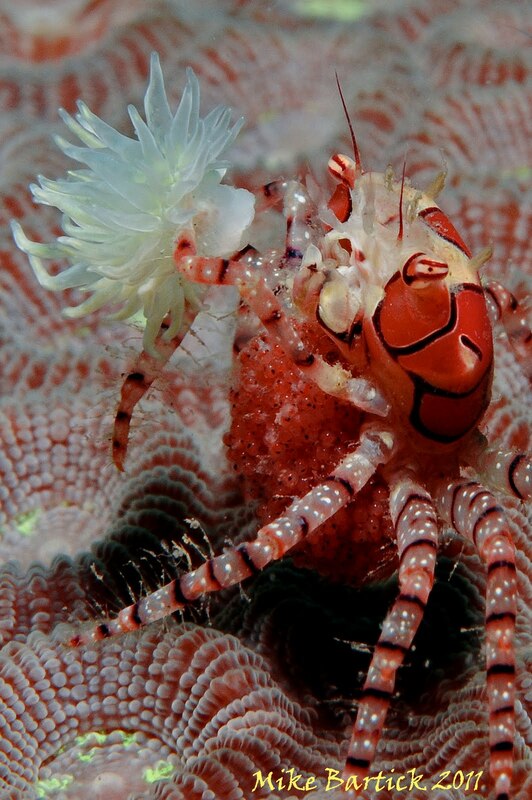 And while many crabs need an anemone to live on as the host, this crab acts as the host and carries the anemones. If one pom pom is lost it will split the other and it will continue to grow and if both are lost it will start over. We found this guy by flipping rocks and coral rubble in the shallows at a local dive site in Anilao. Quickly working a small area will reveal all sorts of things. My guide Peri, was instrumental in keeping this guy from dashing back into the rocks and for keeping fish away. The second we found this guy it was apparent that it was carrying eggs. I shot several photos in succession hoping to get one good one. There are many more quirky facts about this crab and the anemone's, the relationship between the too is one of natures truest forms of symbiosis.